Here's the basic information you need to know when ordering from Deluxe Frame Company. ART PREPARATION: No Charge for copy using our standard typestyles and logos. If extensive art preparation is necessary, you will be quoted an art charge prior to production. See below for art instructions. COMPUTER GENERATED ART: Send artwork to art@deluxeframe.com We can accept art created in CorelDraw X7 or an earlier version as long as art is converted to curves. If using freehand or Adobe Illustrator art must be vectorized and exported as an .eps or .pdf file. We cannot accept jpegs, bitmaps, gifs or tifs. COLOR MATCHING: Any color other than our standard colors will require a color matching charge of $60.00(A) per color. We cannot guarantee perfect color matches. Color matching charges also apply to repeat orders. See color chart. PRODUCTION TIME: Production times are approximate and are listed for each item on each catalog page. Changes made to an order in process could result in a later ship date. If a proof is needed, production time will begin after we have received proof approval. PRE-PRODUCTION SAMPLE: One color imprint $100.00(A) each additional color add $50.00(A) per color. Production time – see product catalog page. SHIPPING INFORMATION: The F.O.B. point is our plant in Michigan. Unless expedited shipping instructions are noted, we will ship by FEDEX GROUND. SPLIT SHIPMENT: Additional $50.00(A) charge for each shipment released there after. All split shipments will automatically be released 6 months of initial order date or earlier if requested. Minimum quantity of 1250 per release. CREDIT CARDS: Credit card information is taken at the time the order is placed but not charged until the order is shipping. EXPEDITED SERVICE: An extra charge will be required to expedite an order to ship in less than normal production time. Contact factory for availability and, above for Rush Services/Charges. RETURN OF ART: Artwork supplied by the customer will be retained in our files unless requested to be returned upon completion of the order. PROOFS: A faxed and/or emailed paper proof will be furnished at no charge upon request. Additional proofs requiring new art or a colored paper proof add $20.00(A). Orders requiring a proof will not be entered into our production schedule until we have received proof approval. OVERRUNS AND UNDERRUNS: 5% +/- for 1 color imprint and 7% +/- for 2 or more colors will be considered a complete order. REPEAT ORDERS: Identify repeat orders by our last invoice number or your last purchase order number. Orders are retained on file for approximately five years. A sample or new artwork will be needed for repeat orders more than five years old. STOCK ORDER REQUIREMENTS: A minimum of $20.00(A), before freight to ship out to one location. PRICING FOR NON-STANDARD QUANTITIES: For quantities ordered between two standard quantities shown in our catalog, the unit rate for the lower quantity will be charged. For example orders for 400 units will be priced at the 250 unit rate, etc. CANCELLATION CHARGE: There will be a $60.00(A) for 1 color imprint and $30.00(A) for each additional color if an order is cancelled after the artwork has been approved. Once an order has been set on a screen or printed, it cannot be cancelled. NOTE: We reserve the right to reject any artwork or order not adaptable to our production capabilities. All orders received will be put into production on a normal 10 – 12 working day schedule unless contacted. Please be aware that colors on these charts are not exact. Please refer to samples or a PMS Chart for exact colors. Actual appearance of the colors may vary if they are printed on backgrounds other than white. 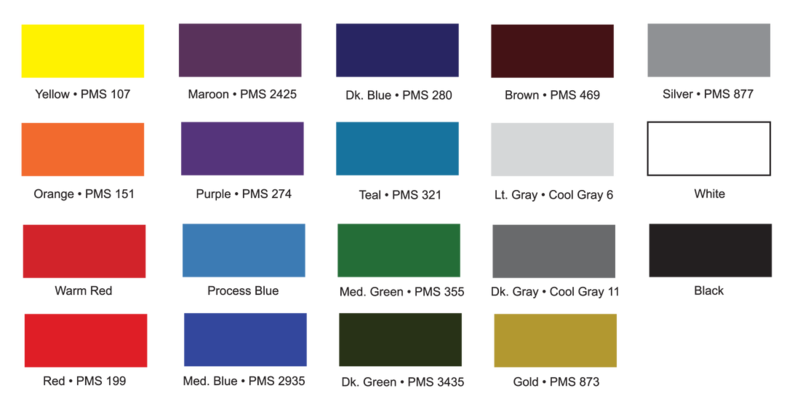 Custom color matches are available for $60.00 (A).